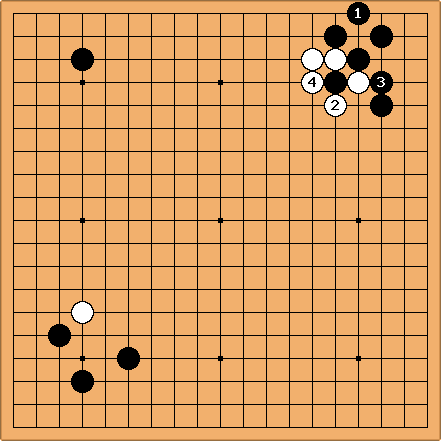 IlyaM (9k): In the game I played on DGS my opponent placed his handicap stones in non-standard locations (so called french handicap). The start puzzled me - I had no idea where to start. 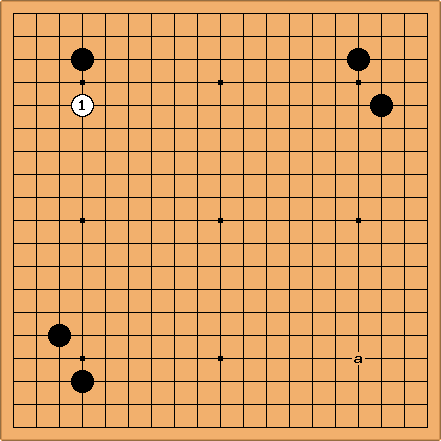 I rejected the idea to take last free corner with 'a' or close move as then my opponent would make third shimari with 'b' and it will be rather hard to find any way to attack black stones. Any idea for the white's strategy in this position? In the actual game I decided to try to start some complex fighting hoping that my opponent being weaker then me makes a tactical error which would allow me to create a strong group for me and weak group(s) for him that I would be able to attack later. So I played hoping for a cross-cut. unkx80: Interesting idea, but I think Black should play at , and allow White to live a small corner. But the bigger mistake is , it helps the opponent quite significantly. unkx80: With free placement of five handicap stones, there really is no standard way of starting the game. Since you specified that you don't want to take the lower right corner, maybe might be interesting. Depending on how Black plays, White might be able to get sente and return to occupy the lower right corner at a.